In a previous article, I described the figure of William Shockley (1910-1989), one of the fathers of the transistor, an invention he achieved in the company of another two scientists: John Bardeen (1908-1991) and Walter H. Brattain (1902-1987). In this text, I look at the scientific biography of Bardeen, the only scientist who to date has received two Nobel prizes for physics. 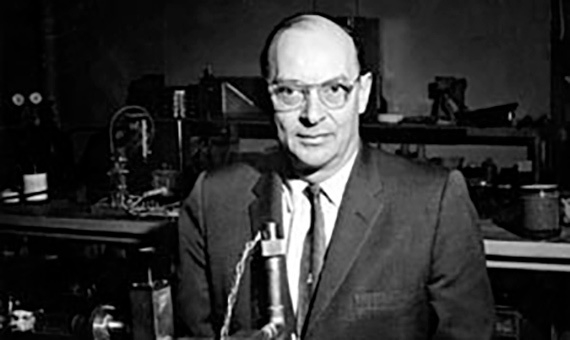 John Bardeen was born on May 23, 1908 in Madison (Wisconsin), into a family who believed in effort, hard work and dedication to society. His university career began in the city of his birth, where he studied electrical engineering between 1923 and 1928. He subsequently remained at the same university for two more years as a research assistant, where he worked on mathematical problems of applied geophysics and on radiation from antennas. Between 1930 and 1933, Bardeen worked in the research laboratories of the Gulf oil company, developing methods to interpret the signals generated by different types of probes (mainly magnetic and gravitational). However, he was more interested in pure sciences than in their practical application, so he left Gulf in 1933 and went on to take a graduate degree in mathematical physics from Princeton University. Between 1935 and 1938 he received a research grant to work at Harvard University with two future Nobel physics laureates, John Hasbrouck van Vleck (1899-1980, Nobel Prize in 1977) and Percy Williams Bridgman (Nobel Prize in 1946). In 1936 he obtained his doctorate from Princeton University. During the years of the Second World War he worked as a civil physicist in the Naval Ordnance Laboratory (Washington, D.C.), in areas related to antisubmarine warfare. After the end of the war in 1945, Bardeen joined Bell Telephone Laboratories, where he became involved in research work on semiconductors, specifically in how these materials conduct electrical current, a new field in those years. In 1947, together with Shockley and Brattain, he developed the transistor, a device that triggered a veritable revolution in electronics. The transistor was invented in response to the problem of how to replace the heavy and fragile vacuum tubes used by the telephone systems of the time with a lighter and more reliable device, requirements that were perfectly fulfilled by the transistor. Bardeen’s essential contribution to the invention is that he was able to understand the problems posed by the surface of the semiconductor that served as a support for the structure so that the device would function correctly. Bardeen elegantly and irrefutably formulated the limiting action of what are known as electrical surface states on the conductivity of the charge carriers in the device, which was decisive in enabling the search for ways to minimize its effect. Brattain, the third member of the team, played a key role in this task. The transistor would certainly have been achieved without an understanding of this phenomenon, but several years after the date of its invention. Basically, the transistor allows a very large current to be controlled and regulated by a much smaller one. Although the details of the way the device works are difficult to explain in layperson’s terms, a good analogy for its operating principle would be an excavator: with a only a minor force, such as the one exerted by the operator from the control cabin, enormous weights can be moved, like the earth or rubble contained in the shovel. This is what a transistor does with electrical currents. In fact, the device’s whole action is based on the control exercised by a small current (which circulates through a terminal on the device, known as a base), over a large current (which circulates through another, known as a collector). This control enables a large number of essential operations in electronic circuits: amplifiers, oscillators and AD-DA converters among others, which are in turn the basis of the operation of a multitude of equipment present in our daily lives, such as computers, televisions, landlines and cell phones, radars, and much more. All the effort made during those years by the team at Bell Labs was later recognized when the three won the Nobel prize for physics in 1956. There is a curious anecdote about Bardeen: when King Gustaf VI Adolf of Sweden was presenting the Nobel prizes he asked Bardeen about his family; Bardeen replied that he had traveled to the awards ceremony with only one of his three children because the other two were studying at Harvard University and he did not want them to interrupt their studies for a motive such as this. The king was speechless at this response, and told Bardeen that if they ever saw each other again, he would make him bring his whole family along so he could meet them; the laureate solemnly agreed, and kept his promise 16 years later. Indeed, we also owe to Bardeen –this time along with Leon N. Cooper (1930- ) and John R. Schrieffer (1931- )− the theory of superconductivity, a phenomenon that the scientific community had been puzzling over four decades. For this second achievement he also received the Nobel Prize for physics in 1972, and is the only scientist to have received the physics prize twice. At the awards ceremony for the second prize, Bardeen brought all his children so they could meet the king, thus fulfilling the promise he had made 16 years earlier. 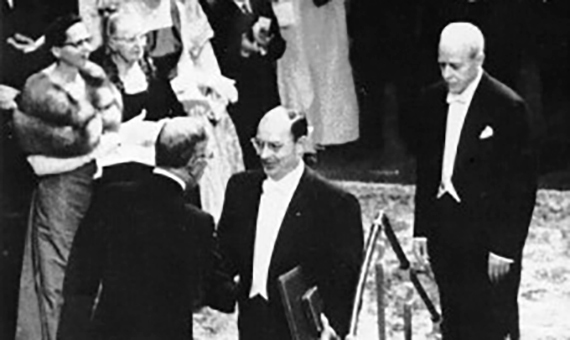 During the Nobel awards ceremony in 1956, greeting King Gustav VI Adolf of Sweden. Behind him, Walter Brattain, another of the prizewinners. He died of a heart attack on January 30 1991, just a few days after publishing the last article of his life, in December 1990 in the journal Physics Today. 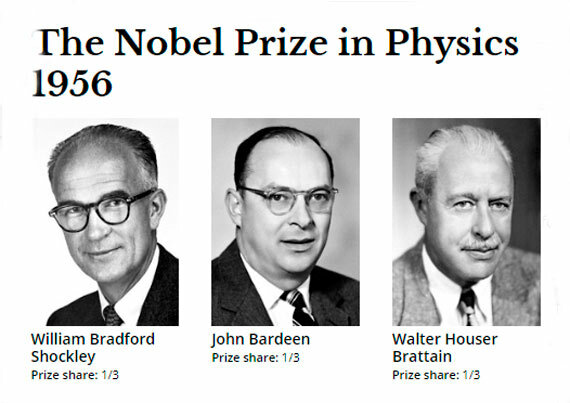 Bardeen’s achievements changed the world much more than the findings of other scientists of his time, but very few people are familiar with his name and his work. Hopefully this article will, albeit in a limited way, go some way toward making up for this omission.